I usually watch my very bright and articulate colleagues post blogs, but it’s been a great few weeks, with a collection of significant public efforts, and some of the efforts need notice. Let’s try a few photos this time. My last blog was related to the Myanmar cyclone and our work on Sahana translation into Burmese, and, in the background, a very little about the Sichuan earthquake in China. I need to catch up a bit and put some other recent events in context. And more. It’s been an incredible summer. I’ll also mention only briefly that we received a lovely gift from the Chinese government for our work with the Yunnan Center for Disease Control after the earthquake. Let’s stay more current in the discussions below, but any reader can feel free to ask me about anything above. Grameen: Dennis Israelski and I just spent a week in Bangladesh with both Grameen (Led by Yunus, Nobel Peace Prize, 2006) and BRAC, the largest NGO in the world. You’ll see a selection of photos below. 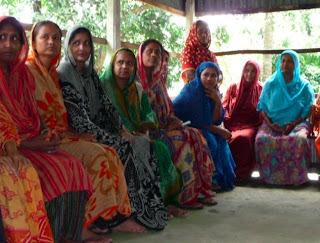 Starting with Grameen, Dennis and I met extensively with the director of Grameen Solutions, Kazi Islam, had lunch with the Grameen Solutions Board of Directors, and took a trip to rural central Bangladesh as guests within a neighborhood Grameen Bank microfinance meeting. 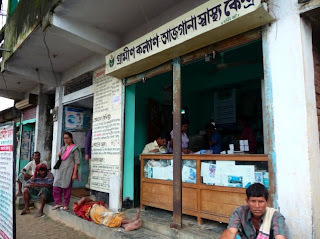 We also visited one of the Grameen Health Centers where disease monitoring is taking place by sending staff from these centers to a network of villages each day, then reporting the conditions in the villages to a doctor in this center. Those who run the Health Centers are asking for GeoChat on a model very similar to what we intend for the MBDS cross-border sites. These ladies are a part of the network developing for village disease reporting because they are, of course, already a network. 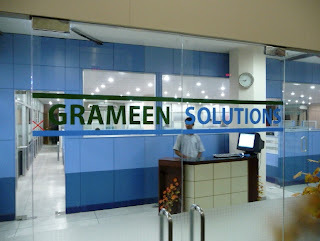 Shafqat, the CTO for Grameen Solutions. Ed and Robert wrapped into one, plus a beard, cap, and thobe. Speaks gorgeous British English, native Bengali. Smart, cheerful, very impressive man. The smile was constant. We saw a lot of his work. 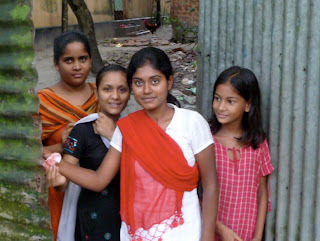 BRAC: BRAC is, to my understanding, the largest NGO in the world. 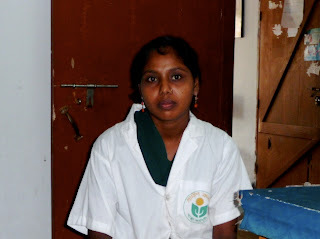 They work generally on primary education, children’s health, and gender-based microfinance. 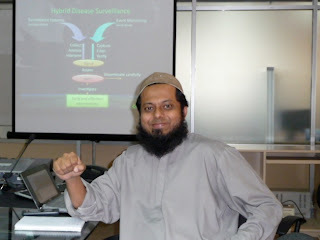 They have recently started a school of public health on a model that is considered one of the best in the world. Dennis and I met with the Dean of that School, Professor Mushtaque Chowdhury, for a discussion of an Innovation Lab linkage between that school and the Cambodian School of Public Health, the topic to be “collaborative public health epidemiology and informatics”, teaching our methods and our tools sustainably in a format that gains credibility and academic rigor. Professor Chowdhury (who is also a full Professor of Epidemiology at Columbia in New York) liked the idea very much, as did the Cambodian National Institute of Public Health, overseers of the School of Public Health in Phnom Penh. We’re working now on a proposal to link the two, since BRAC wants our tools for their school, Cambodia wants the BRAC curriculum model and our tools, and we want to ensure sustainability for the collaboration meme in public health informatics. How better than to embed it carefully and responsibly in the educational systems? 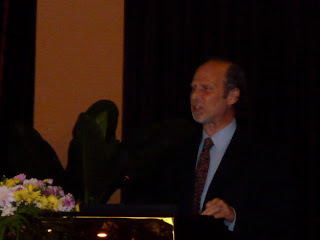 MBDS: Dennis and I then joined Ed Jezierski in Phnom Penh for the Mekong Basin Disease Surveillance Network (MBDS) Regional Forum, the Coming Out party for our tools and methods within the medical and public health providers for six nations in Southeast Asia. Photos below. Dennis, as co-chair of Information and Communications Technology (ICT), spent a lot of time at the podium and leading ICT workshops. 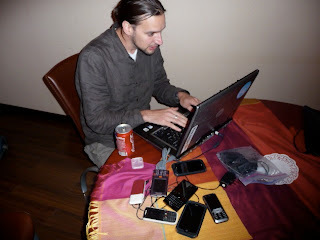 We were (and are) only technical advisors and NOT technology implementers (Very Bad Idea) but Dennis had a decent bit of responsibility regardless. We also, at this meeting, hosted a mini-conference for the demonstration of our tools. 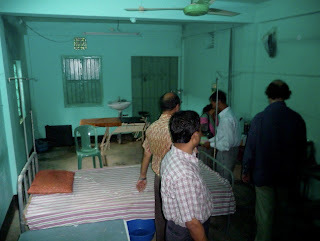 It took place on a Tuesday evening from about 5pm to 8pm. Photos below. We had a remarkable turnout – 73 registered attendees – and we had a TON of questions, comments, people trying GeoChat submissions in real-time to the number we gave them, and lots of post-event crowds around each one of us. Despite our groaning internally about the somewhat clumsy delivery process we used for our message, and more technical difficulties outside of our control than we really wanted to endure (broken cables, failed phones, loss of hotel internet halfway through, etc) we were apparently a pretty good story anyway. 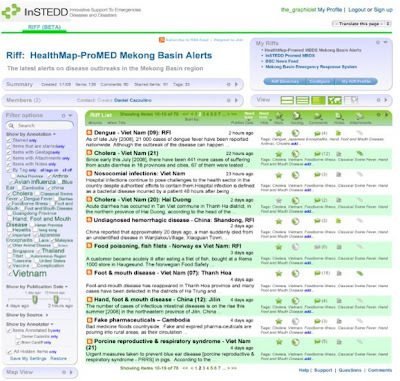 We have a page of requests for collaboration including WHO’s WIPRO office in Manila, the Ministry of Health in Laos, the Yunnan CDC in China, ProMED-MBDS, US-CDC in Asia, RAND Corporation, and a dozen others. We were hot. 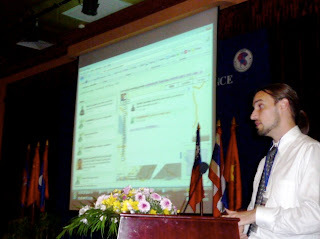 There will be a trial of our stuff around a dedicated ICT meeting in Savanakhet, Lao, probably in early November. At that point we will have Stung Treng and Champassak already explored in September (I hope), and we’ll arrive a day or two early in November and try linking – for the meeting – Mukdahan (Thailand) and Savanekhet (Lao PDR), and Savanekhet and Quang Tri (Vietnam). They are already rather tech savvy and have been cooperating with each other so this should be a small step for a trial. That will give us trials of cross border links in Cambodia, Vietnam, Laos, and Thailand before the end of the year. Not bad. More attended than we expected. 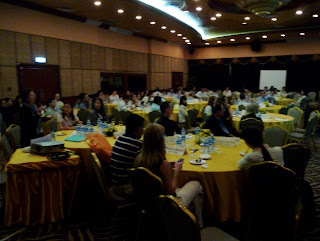 We’d had a little warning that day so we shifted the workshop venue to the plenary hall. GeoChat: Now available. This week it grew from weak as a kitten to perhaps the maturity of Baron Rojo, Ed’s very large puppy. It’s not a mature tool yet, but it’s clearly no longer just embryonic potential. We used it in Phnom Penh with strangers on the fly and it worked well. I used it at Burning Man this past weekend. We’ve been asked to have it available for hurricane season, and we’ve been asked to introduce it to the WHO regional office, WIPRO, in Manila for their field staff. OK, good stuff. We’re getting out there effectively. This one hit the mark. Riff: Riff, our collaborative decision support tool, works well, and just as designed within the internal architecture, but it needs, I think, deeper exposure in the field to optimize the user interface. I think, to start, I want to start using Riff daily beginning this coming week within my own office. As it happens, we had a PERFECT Riff problem appear in India while we were at the MBDS meeting and - disappointingly - we all wound up discussing it on a series of disjointed emails around the world. Riff is designed to help with precisely this problem - teams of people around the world collaborating quickly around a news item with a number of bots and automated services to help users make informed decisions with context. Unfortunately we were only a couple of days from having it ready. We’re there now, but we missed that brief window. Rats. We are also making sure GeoChat messages go into Riff seamlessly and show up on a map module that we can then annotate for GoogleEarth through Mesh4x. We will be very sure our creations gracefully understand one another. If there are bright designers out there who would like to help with some open-source humanitarian software UI design that we give away for free for use in Very Bad Places, please drop a note to Info@instedd.org or write me directly at Rasmussen@instedd.org. I’m looking for clever, creative ideas for helping Riff be a better interface on top of the already superb capabilities built into the features and modules. This tool has to be effective in helping users collaborate when they're hot, filthy, exhausted, a little scared, badly overburdened, and responsible for lives. Below is an older version of Riff (perhaps three weeks), one view. It looks quite a bit better than this now, but it’s still in process. Note that the function really is quite decent. Its only the interface that is not yet intuitive. Mesh4x: Mesh4x, though the most technical of our products and the one with no user interface, is probably our most successful beast to date. It’s now been built into the OpenROSA effort called JavaROSA and will be introduced in Tanzania within the next month as a part of OpenROSA / OpenMRS and will have genuine use in the field. To quote Mulan, “our baby’s all grown up and saving China” (overstating somewhat and getting the geography wrong). Mesh4x does a lot of linking from one thing to another, is fluent in several important computer applications, and plays very well with other communications devices. Mesh4x is also, curiously, the easiest story to tell: Bad disaster, lots of tents on the hillside where humanitarian staff are working, assessments happening everywhere and being saved in Excel or Access or GoogleEarth, so lots of people collecting lots of information in stovepipes. Very inefficient, and maybe unsafe. So then (socially) we agree to share information and bits of interest, then (technically) we introduce Mesh4x. Now, with Mesh4x helping, I move my pushpin on Google Earth in my tent, your Excel spreadsheet in your tent changes, we’re all sharing information in crisis, it’s efficient, with less redundancy, better use of donor dollars, and it’s all over SMS with no internet, using freely available libraries. Easy story. Great utility. Interesting idea. Perfect. RNA: RNA is a set of tools (modules) within Riff for analytics and they are better than I thought it would be at this point. It might be the best of the Riff module set and has surprised a few people with it’s accuracy both in diagnosis and in defining relationships. RNA is a distinct tools set, even though within Riff, and so we look at it separately. It’s apparently going quite well, using a team led by Dr. Taha Kass-Hout and involving Nico in Argentina and some interns from Trinity College who turned out to be excellent (or well-led? Or both?). We’ll keep this going. You can read about it on Taha’s blogs. 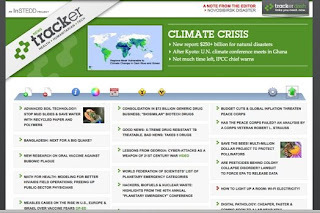 Tracker: Tracker is our web aggregator for health and humanitarian technology stories. We kept finding such great stuff buried in obscure places that we thought we had to build something that would allow us to share the new discoveries and capabilities with the entire humanitarian and global public health communities. It will be up for us this coming week. Tracker, I’m told by reliable people, will be informative, well-designed, appealing to look at and interact with, and effective to use. We’ll know very shortly. I’m pleased to note that, on Tracker, we’ve been involved with the humanitarian blogging community, UN relief agency staff and former staff, news organizations, NGOs, and others making sure content and form are aimed well. The feedback has been very positive and a number of sites are watching for us. I suspect we’ll get known pretty quickly. 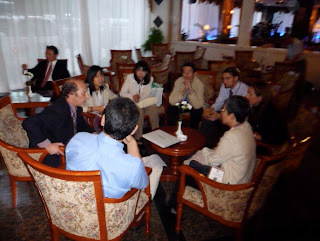 As a last thought, my special compliments to the Clarius team working so closely with us in Argentina and in Cambodia. Daniel, Nico, Laura, Miguel, Luigi, and the rest are truly among the very finest coders, testers, QA staff, designers, and teachers I’ve ever run across. They’ve been doing consistently outstanding work, under great pressure, across a 15 hour time difference, and across really challenging communication systems, in at least five countries. All of their work has been done with care, cheerfulness, competence, and flexibility and the result has been a stunning output, with four major efforts ready for release from a small team in about eight months, starting from zero. It's a remarkable accomplishment. Let me here, publicly, convey gratitude and admiration to each of them from all of the staff at InSTEDD.